Updated 10/30 — So, “Taste of the Village,” happened in mid-September at the Park, hosted by the Village Alliance, the 8th Street BID. 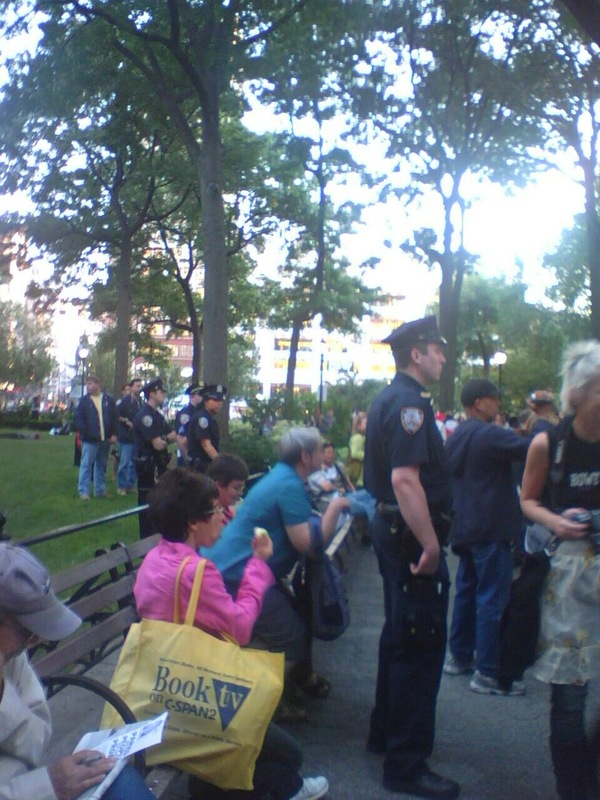 This post about the event got delayed due to dying trees, stalled construction and the occupying of Washington Square Park. Since I try to mix it up a bit here, even a bit late, I wanted to report back on the event. Readers of WSP Blog know that I am not in favor of the trend of privatization of public space — which has increased greatly under the Bloomberg Administration — that includes endless reliance on the model of park conservancies and BIDs – business improvement districts – to either oversee or be entrusted with funding and programming at parks. We could certainly tie the Village Alliance (the BID from nearby 8th Street) among those pushing at the onset to dramatically redesign the park, particularly under former director Honi Klein. 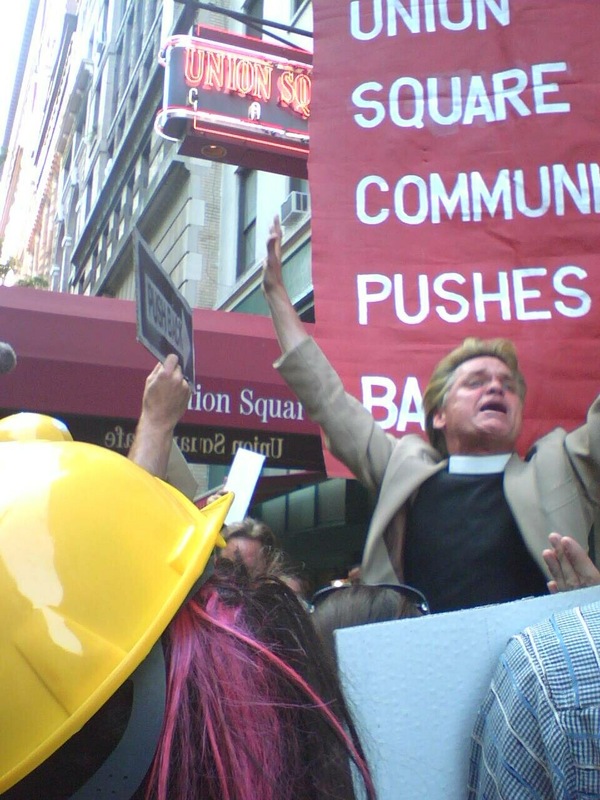 (Klein, inexplicably, also held a position on Community Board 2). There’s a new executive director at the Alliance now, William Kelley, who seems a little more of the times. This was the first “Taste of the Village” — which is considered a “benefit” to raise funds forthe park and has taken place for the last 9 years — under his watch. I thought it might be nice to experience the event. Kelley accommodated my request to attend and here are some photos and commentary. Set between the Arch and taking over part of the Fountain Plaza with the Fountain in the background, the evening focused on tables laid out with sampling – tastings – from local or nearby restaurants. There was a strong emphasis on meat dishes with only two vegetarian and onetwo fish options. The fish, fluke I believe, from Perilla on Jones Street was quite good. (I don’t eat meat so, in my opinion, Taste of the Village could nix a few meat dishes and add some other more vegetarian-friendly options.) There were vendors offering wine – red, white and rose – as a band played against the backdrop of the fountain. Tastings included offerings from local restaurants and businesses such as Alma, Eva’s, La Palapa, 8th Street Wine Cellar, Gusto, Knickerbocker Bar & Grill, BLT Burger, The Lion, Otto and Argo and Rob’s Really Good Teas (which I really like). The ticket price was $50 and director William Kelley says that about 400 people attended (did it seem that high? I’m not sure). He said that typically the organization raises about $50,000 for the park (includes money from sponsors). People I noted by sight were members of Community Board 2 and also the city’s Parks Department. I was surprised that there was no talk or introduction as to why people were there — but maybe that was for the best. Overall, it was a festive soiree and those attending seemed to enjoy it. Still, it raises questions – We have a city public space undergoing a redesign that started out with a budget of $16 million — which many felt was already unnecessarily high. Now, we see that the projected costs have skyrocketed to double that. If money had been properly allocated and monitored to begin with, would we really need private forces to be raising money to upkeep the park? The Brooklyn Paper takes a look this week in an editorial, “Bidding Adieu to BIDS,” at the formation in the ’70’s of the Business Improvement District, an entity which has become increasingly popular in Mayor Bloomberg’s New York. According to the weekly, there are 60 “quasi public” BIDS, as they are called, throughout the five boroughs. As I’ve written here before, these organizations play a complex role in neighborhoods, taking over services the City itself should be providing, while spreading their tentacles outward in ways that are never quite as harmless as they may seem. Taxes on business owners within the so-called “BIDs” raise $80 million — on top of the taxes already taking a bite out of Mom and Pop. We’re not naive as to why BIDs were created two decades ago. The city was not — and, indeed, is still not — doing a good enough job providing sanitation and security along some of our busiest commercial strips. With the city abrogating these most basic of services, business owners jumped into the breach, taxing themselves to make up for the failure of our elected leaders to ensure clean and safe streets. … We agree with the BID renegades on the issue of who should pay to keep our neighborhoods clean, safe and vibrant. To us, this is solely a city responsibility. Although the Brooklyn Paper almost comes out in favor of gentrification in their Editorial, claiming it’s all about “change,” the rest of the information is on point. For more on the Business Improvement Districts and their negative consequences, see previous WSP blog post: Parks for Sale and the Privatization of our Public Spaces by Robert Lederman which looks at the Business Improvement District, the (purposefully) mildly named Union Square Partnership, which oversees – and has total control over – Union Square Park. For more on the Business Improvement District around Washington Square, the also benignly named Village Alliance (formerly the 8th Street BID), see recent WSP Blog post here. What we need are COMMUNITY Improvement Districts! Thursday night. Union Square. The setting of Union Square Partnership’s Harvest in the Square, an annual gala held by the ubiquitous BID (Business Improvement District). Although their promotional materials stated the gala would inhabit the “west plaza” of Union Square Park, in reality, they took over half of the south plaza as well, including the area surrounding the George Washington Statue. Billed as the “premiere food and wine tasting event,” tickets ranged from $125 to $400 for VIP early bird event. The BID — the ones who want to put a private exclusive restaurant in the historic Union Square Pavilion, thereby shutting off more public space — is led by Jennifer Falk. Falk previously worked for Mayor Bloomberg. (Funny how it’s just a game of musical chairs at times.) 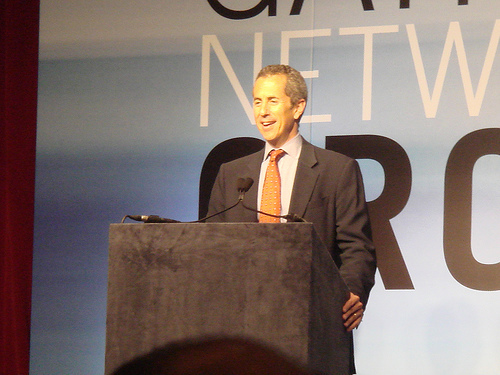 Co-chair of the BID is restauranteur Danny Meyer. I don’t think they were prepared for the festive arrival of Reverend Billy and assorted citizen chef/passionate public space advocates who came out to chant their message and bang some pots and pans saying ‘no giveaway of our public space’ – as we watched our public space taken over by the BID for their harvest gala. People sitting around Union Square all curiously watched and eagerly took flyers which stated “Parks for People – Not for Profit.” We’ve all gotten so buttoned-down in New York. How often do you see such a creative action? All too infrequently. Oh, and yes, our NYC Parks Commissioner Adrian Benepe, was there and addressed the crowd at the gala event. I think his speech may have been, um, overshadowed by the sound of the citizen chefs (and their pots, pans, and chants) however. All too fitting. The BIDs in more recent years have gotten more sophisticated and yet wish to appear ‘just like us.’ A part of the community. The Union Square BID is a 501(c)3 non-profit — something we link with advocacy groups, not organizations trying to promote more shopping. 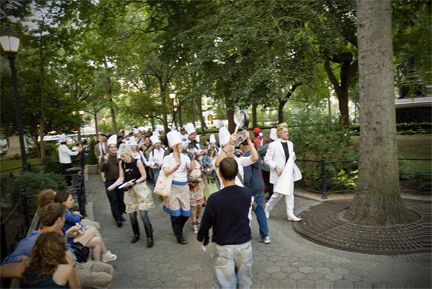 Around Washington Square Park, the BID – previously known as The 8th Street BID – changed its name to the Village Alliance. Doesn’t that sound neighborly? CITIZEN CHEFS COOKING UP CHANGE! YES to public space, community, and democracy. Without community space, there can be no democracy. My previous post 9/15 here elaborated on this event. Danny Meyer chairing gala event in Union Square Park Thursday 9/18 – and Citizen Chefs Cooking Up Change will be there too. Union Square Not for Sale moves into the fall season with a bang! (literally) when Citizen Chefs Cooking Up Change meets up Thursday night, September 18th, as restauranteur Danny Meyer co-chairs Harvest in the Square in Union Square Park. Billed as “a festive celebration of community and cuisine,” Harvest in the Square is presented by the Union Square Partnership — the local BID, business improvement district (which Meyer also co-chairs). Described as “Manhattan’s premier food and wine tasting event,” tickets are $115; $125 at the door. VIP pre-event starts at 6 p.m. Tickets are $400. Well, isn’t that … um, GREAT? Except… they are taking over our public space (already threatened) for a private event. Except… Our public parks should be funded by our City budget and not a private organization which then retains incredible control over the public space. The New York City budget allocate less than 1/2 of 1 percent of the entire budget to Parks and public spaces. Yet these areas comprise 14% of City land. Except… Union Square Partnership is interested in “beautification efforts” to help improve business – around Union Square. 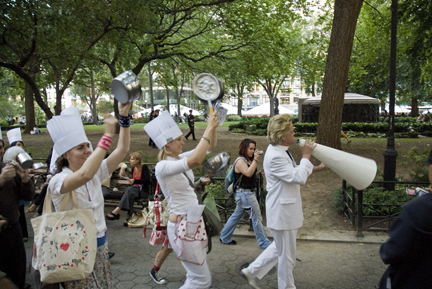 We are interested in public space, interactions, people, community, art, conversation, politics – in Union Square. Except… Union Square is a PUBLIC SPACE, and like Washington Square Park, it is important that it be regarded AS an important public space. It’s not just about beautification as these architects and realtors and business people would have us believe. Once you gloss everything over, you lose the gritty, you lose the bohemianism, you lose the unique indescribable interactions that can occur in these places when you gear the space for one type of person (which is happening at both these parks). Except… Everyone becomes a bit more Stepford. No offense to Mayor Bloomberg (although regular readers know I am not a fan) but our CEO Mayor needs to stay out of our public spaces. Our Boston-raised Mayor is not the model for how to keep New York New York. How to keep Wall Street Wall Street and keep us believing that the Financial District is the most important thing for our city? That he does quite well. THURSDAY, SEPTEMBER 18TH, 6 P.M.
Bring some pots and pans (and something to bang on them with) and your spirit (or just bring yourself). Attire: Festive — &/or Come in costume – black pants, white shirts, bow ties… Union Square Not for Sale will provide chef’s hats. The Union Square Partnership is selling out one of our most important public spaces, the pavilion on the north side of Union Square, site of seminal speeches from Emma Goldman, Paul Robeson, Cesar Chavez, Dorothy Day and many many more, rally site of the first Labor Day Parade, AND one of the last remaining public assembly areas in the city. More Info: Union Square Not for Sale. The “Push Back Picnic” presented by Union Square Not For Sale/Community Improvement District(CID) occurred at Union Square Park yesterday and contained a bit of a surprise for restauranteur and Union Square Partnership co-chair Danny Meyer. Union Square Partnership is the local BID(business improvement district) and has tremendous influence over what goes on at Union Square Park. It is their plan that aspires to place a private restaurant in the historic Pavilion at Union Square. The picnic began on the lawn at Union Square near the Abraham Lincoln statue on the northern end. 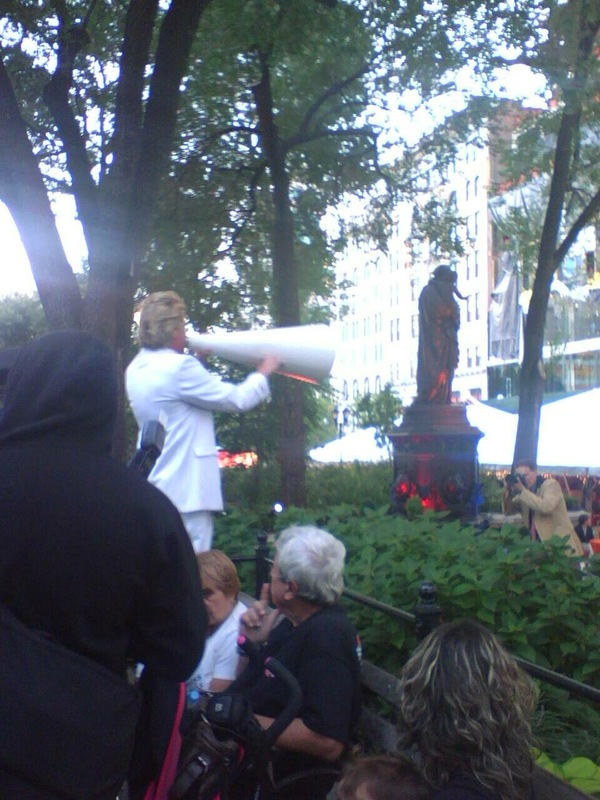 There was preaching by Reverend Billy, singing by Community Improvement District/”Church of Stop Shopping” choir, petition signing (to stop the building of a restaurant in the historic Pavilion and further privatization of the Park) and watermelon! 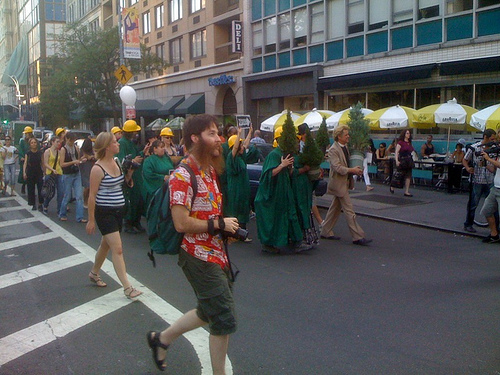 Then, a large contingent, including a marching band, carrying trees marched through the Park and along 16th Street until they came to Danny Meyer’s Union Square Cafe. Reverend Billy, Savitri D. and others sauntered in bringing with them the trees to the surprise of stunned diners and restaurant staff. Their message: “Union Square, Not For Sale.” The Park is pushing back. The BID has had enough influence on the Park; the community is pushing back and reclaiming our public spaces. 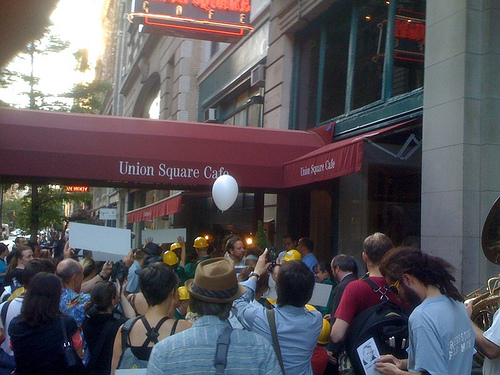 A large sign appeared in front of the Cafe: “Union Square Community Pushes Back.” There was chanting. “Union Square. Not for Sale.” The lively group then marched and chanted its way along 16th Street back to the Park. Really not enough of this type action goes on in our city right now. Diners seated outside at the Blue Water Grill and the Coffee Shop, both on the corners of Union Square West, watched in awe, took pictures, some chanted along.